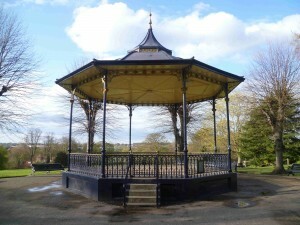 Colchester Castle Park is very lucky to contain a Victorian bandstand. This is used through the summer by traditional silver bands and some more contemporary artists playing more modern music. There is nothing better on a sunny afternoon than packing a picnic, laying down a rug on the grass that surrounds the bandstand and then enjoying you picnic while relaxing listening to the music. You don’t even need to take your own picnic as the bandstand is located in the upper castle park close to the Cafe in the Park. This means you can go and get some take-away teas or coffees together with an ice cream and, if you are lucky, find an empty bench close to the bandstand. Another option is to use one of the tables laid out by the cafe for their take-away customers. You can find a full list of the planned concerts on the Calendar Events page and then select the Category ‘Bandstand’. Remember, some events are subject to change so please check before attending. The really good news is that all of the events scheduled for the bandstand are Free. Even more of a reason why you should make the time to come along.